Hands & Voices (Manos y Voces) está dedicada a ayudar a las familias con niños sordos o con dificultades auditivas, de manera imparcial respecto a modos o metodologías de comunicación. Somos una unión de padres, una organización sin fines de lucro que ayuda a las familias con los recursos, redes sociales, e información que necesitan para mejorar el acceso a la comunicación y elevar los resultados educacionales para sus niños. Nuestras actividades de extensión, la colaboración padres / profesionales, y los esfuerzos de apoyo y soporte están concentrados en posibilitar que los niños Sordos y con Dificultades Auditivas alcancen su potencial máximo. been, been waiting on a program like yours"
sordos" "May God bless you for all you do for us and our deaf children"
Pérdida auditiva “Mínima”: Que quiere decir eso? "Minimal" Hearing Loss: What Does it Mean? Que se abran las puertas: Opciones de tecnología y comunicación para los hijos con pérdida auditiva.
? Que tan bien oye su hijo? Familias latinas describen sus experiencias de la vida real cuando recibieron los resultados de "no aprobó" o "remitir" en las pruebas de audición de sus bebés. En este video en español adaptado culturalmente cuentan cómo se sintieron cuando les dieron los resultados y lo que hicieron después. 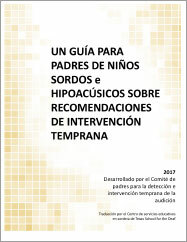 Sus historias proporcionan datos y motivación para ayudar a los padres a buscar los servicios de seguimiento que sus bebés necesitan. This Video features Spanish-speaking families describing their experiences when they received "did not pass" or "refer" results for their babies' hearing screening. The families describe how they felt and what they did next. Their stories provide facts and encouragement to help other parents seek out the follow-up services their baby needs. "I think this video is best to be seen alongside someone who can help answer questions. For new parents, I wouldn’t point them to it and leave them alone with their thoughts. A Parent Guide or a professional may want to be there with them to sort of debrief what they saw and how they feel. It’s packed with really good information for Latino parents. …For new parents, the first 6 minutes are very informative about the follow up tests, talking with your doctor about the results and checking for other health risks, and how to go about getting a second test. At the end of the six minutes it says that early intervention is important for the kids to achieve their highest potential. Ending it right there may be more objective and positive at that stage when parents are just finding out what is going on. I think it would be a good point to stop the video and chat with the parents about what they understood and any questions they have and make sure the positive points sink in. Then, maybe continue watching the rest. So I would show the video while sitting next to them and having a chance to stop it and chat. For parents who already have confirmation of hearing loss and are farther along in the process, they might be more interested in the last part of the video." Materiales gratuitos: Solicitar Materiales- CDC tiene folletos gratuitos, carteles, hojas informativas, y más para los padres, los profesionales de la salud y profesionales de salud pública. ¿OYE BIEN MI HIJO? Bebés y niños con sordera o pérdida de audición.